Studley Royal Park including the Ruins of Fountains Abbey is a human-made landscape around the combination of a medieval monastery and an 18th century water garden. They were brought together by William Aislabie in 1767, when he added the neighbouring ruins to his family estate. 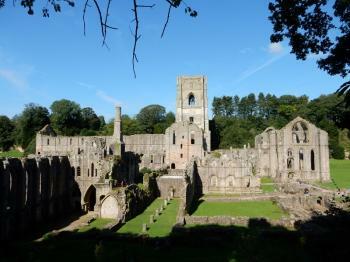 Fountains Abbey was founded in 1132 by Benedictine monks, who later became Cistercians. 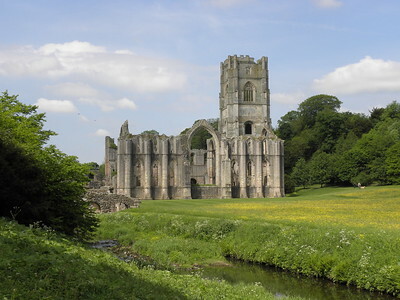 The abbey turned into the largest and wealthiest in England. It operated for over 400 years, until 1539, when Henry VIII ordered the Dissolution of the Monasteries. 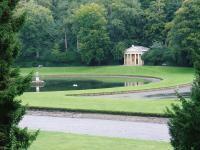 The site also contains features dating from the eighteenth century such as Studley Royal Water Garden. The garden's elegant ornamental lakes, canals, temples and cascades provide a succession of dramatic eye-catching views. 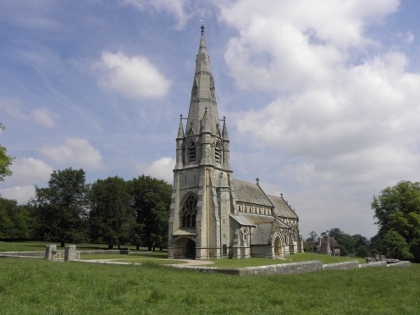 Furthermore, the lands include the Gothic Revival St. Mary's Church, a masterpiece by William Burges. Before visiting a new WHS, I always read the AB evaluation to see if there are any specifics about the site that you would not gather from a “normal” guide. Although Studley’s nomination in 1986 wasn’t that early in the process, it was among the first batch of UK sites. The country actually nominated only Fountain’s Abbey and St. Mary’s Church, which ICOMOS found an odd combination to have with two buildings from totally different eras. They responded with a conditional inscription, suggesting that the 18th century landscape gardens should be included. The result is that the focus of the WHS has shifted from the two monuments to the park, with a totally different OUV. So now it’s park that we visit, a huge English landscape garden with some French touches. I was the first to enter on the day, and wasn’t bothered by any crowds that would show up later in the day. I followed the main walk that is described in the site’s brochure, which takes you from the Abbey along the Canal to the Water Garden and Lake. It ends at St. Mary’s Church and the Deer Park. When you end up on one side of the canal, it’s quite a walk to backtrack to see something on the other side (and that’s how I missed Fountains Mill). What I did see though was the view from Anne Boleyn’s Seat – probably the most iconic vista of Studley, as also shown by most of the reviewers below. From there I walked through the forest to the Lake, a pleasant walk but not too spectacular. After having a drink at the Tea Rooms, I went on to St. Mary’s Church. This I found to be the second highlight of this WHS – the interior is so frivolous! I ended my visit with another hike: I had taken with me a printed copy of the “Ancient Trees Walk”. This 4km route takes in the long avenue of lime trees, which ends at the East Gate of the park and visually connects Ripon Cathedral with St. Mary’s Church. It crosses the Deer Park, where I became more interested in the deer than in the ancient trees. The deer (3 different kinds) roam around in big herds here. They are “wild” – they are not fed by humans, but are enclosed within the park’s borders. I found them a lot less skittish than normal deer, they even blocked some of the foot paths and stared at me intimidatingly. P.S. : Besides the official website, information on Studley Royal is a bit scarce. At the site's shop I found a small but comprehensive book by the National Trust ("Fountains Abbey and Studley Royal"), which opened up the past and present of this WHS for me. March 2018 - After our visit in Durham we came here to Studley. The visitor center is very nice and modern. After the rain paused for a bit wen walked through the park. A lot of pheasants walked around and made it an interesting experience. After a short walk we reached the ruin. It is the heart of the park and way older than the park itself. However it is not a ruin, but was never finished, at least thats what we learned in a documentary about Studley. The rest of the park is not that spectacular, but certainly a good example for English Garden Architecture. This is a site I went to with rather low expectations, but which turned out to be very interesting - and the fact that I visited on a gloriously warm and sunny September day certainly helped. 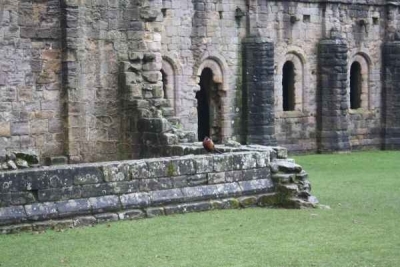 The huge ruins of Fountains Abbey (not all ruins, many elements are still standing) are really amazing, and give you a great picture of monastic life in the Middle Ages. You can walk among them for hours, and the abbey is probably one of the best monastic/religious sites I have seen so far. Once you have satisified your curiosity with the ruins, a pleasant walk takes you through the Studley Royal Water Garden, which was created around the ruins in the 18th century. I always wondered about the odd combination of a 12th-century monastery with a formal Baroque garden, but they fit together well and form a coherent whole. All in all, I had a great day there - just one advice if you plan to arrive by public transport: there are only a handful of buses every day (line 139 from Ripon), and only on 3 days a week, so careful planning is necessary. I went on a Saturday (taking a train from Leeds to Harrogate and continuing by bus to Ripon) and it worked out fine. I visited this WHS in June 2016. Getting there by car from Saltaire, I drove through some narrow rural roads and I could already appreciate the green surrounding landscape. Once you get close to the car parks, the first thing you see is a huge green board stating that this site is a WHS and apparently it is the only 'official' board which states so. There's no plaque even though this site was inscribed in 1986 together with another 6 WHS in the UK. The car park is free but entrance to the Studley Royal Park costs 13 pounds! The map given when you buy the entrance ticket is very good and clearly indicates the loop to follow. A few steps after leaving the visitor centre and just after Swanley Grange, there is the first important crossroad. Although you might be tempted to go straight to the Fountains Abbey ruins which are visible from this crossroad, if you want to visit everything head towards the opposite direction towards Fountains Hall and Fountains Mill as the trail will then follow the same trail to the Abbey. 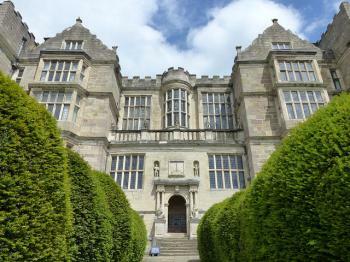 As part of Studley Royal Park's 30th anniversary as a WHS, in June 2016 there was a small exhibition in Fountains Hall (picture) on this WHS and on world heritage in general. The highlights of this WHS are the Cistercian ruins, St Mary's Church interior and the surprise view. To be honest, I failed to see any OUV in this WHS and it's more of a national heritage. In the UK alone, there are several parks, gardens and Cistercian ruins that are on par. The park is mainly visited by elderly people who go there for a stroll in a well kept park. Ultimately that is the gist of this WHS's experience. I'm glad I stopped at the different tea rooms for some scones as they helped me enjoy this WHS as much as possible. From the beautiful spa town of Harrogate, after having a nice breakfast at the famous Betty's Tea Room, I took a conveniently bus line 36 to the city of Ripon to visit the famous Royal Studley Park, a World Heritage Site and reportedly one of the best site to visit in the historical Yorkshire. Instead of walking to the park from Ripon like many tourists, I decided to take an alternative route by starting my walk from Lead Lane which is located along the bus route before Ripon. From Lead Lane I walked thru residential zone until I reached a small river and crossed the bridge, after crisscrossing the farm along the trekking route I finally reached the gate of the Deer Park. 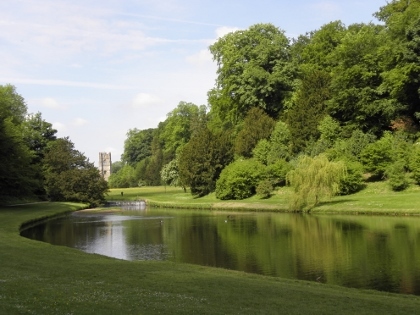 The famed Royal Studley Park could easily be divided into 3 areas, Deer Park, Water Gardens and Ruins of Fountain Abbey. In Deer Park, the park landscape was a mix of light forest and English Garden, the centerpiece of the area was the Gothic St Mary Church and its straight road that cut the park into two and made a visual link between the church and Ripon Cathedral, a really nice landscape design that rarely fine in England. The park was said to have deer, but I could not find anyone of them. After Deer Park I continued south to the Water Gardens, it was here where I have to pay entry ticket. The garden was quite a popular place for tourists, I made a visit on a cold and cloudy weekday in February, but I still found more than a hundred people walking in this place. The gardens were located in the valley with lovely designed ponds and water channels decorated with medieval tower, Greek temple and marble statues. At Anne Boleyn's chair, the views of the gardens were just pretty and it was here that I saw a first view of the Fountain Abbey. Overall the Water Garden was truly an enchanted landscape full with surprised and wonder of why it was here in this corner of nowhere. The last part of the park was the ruins of Fountain Abbey. The ruins was really big, and many part of the ruins were still in good shape and beautiful. The ruins itself was worthwhile to visit. After the ruins I walked to the Mills to have lunch, and then walked back to the Water Garden to see the beautiful landscape in the different angle before continued back to Deer Park and the city of Ripon via the seven bridges route. It was a nice visit, the landscape was lovely and really made me comparing with the beautiful gardens in Suzhou. Even though the Studley Garden and Suzhou gardens were built in different culture, they shared many similarities of strolling landscape garden idea, the designers laid these gardens to surprise viewer every turns by using structures or even trees as borrowed landmark, the ruins of Fountain Abbey was a great example of this trick which cleverly use the valley landscape to hind and dictate the sight of viewers until the last minute at Anne Boleyn's chair. After back to Harrogate, I had a high tea at Betty's Tea Room again, a perfect way to end this memorable day. This was a great place to spend a leisurely afternoon and was one of the more impressive WHS I have visited in England. The planned gardens were particularly impressive especially the highly formal water garden. Many of the gardens I have visited in the UK have a folly as their focal point, however here the huge remains of Fountains Abbey provide a much better focus. The view from Anne Boleyn's chair is magnificent and shows the best aspects of this planned landscape. I was actually surprised by how extensive the ruins of the abbey were, I was expecting a small church and maybe a few crumbling walls. 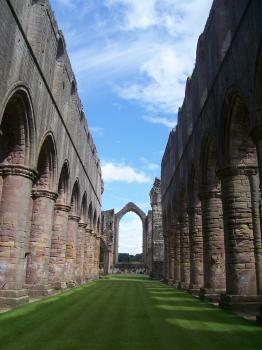 However the ruins were very large reflecting the fact that this was one of England's largest abbeys. You have to pay to enter the formal gardens and abbey, however all are free to walk through the Deer Park and visit the impressive neo-Gothic St Mary's church, both of there are really great additions to the world heritage site. The site is located just outside of Ripon in north Yorkshire. If you don't have your own transport then there are regular buses on Sunday's and few infrequent ones the rest of the week. I unfortunately missed one of the few busses on the Saturday that I visited. However I had half expected this and was prepared for the pleasant 5km walk from the town centre to the start of the gardens proper. It was nice to get into the countryside, and although it wasn't particularly well signposted there always seemed to be a friendly local on hand whenever I reached a cross roads. This was one of the better WHS I have visited in Britain and the layout of the formal gardens when mixed with the extensive abbey ruins made this a very rewarding site visit. To get to Fountains Abbey I took a #36 bus from Harrogate to Ripon from where there was a #139 minibus that took me to the visitor centre inside the park. From there it was a short distance to the ruins of Fountains Abbey, which are quite extensive and take some time to explore. 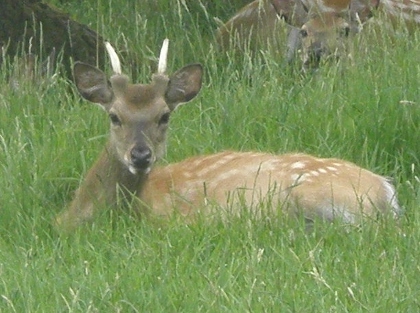 From the abbey I contined through the Studley Royal water garden, past temples, lakes and follies to the deer park. Later I returned to the visitor centre by way of St Mary's church to catch the minibus back to Ripon. 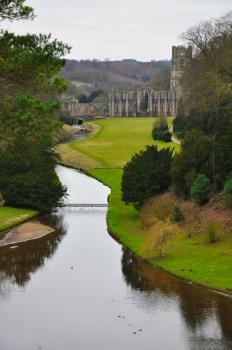 The Ruins of Fountains Abbey is a really mystical and magical place to be, well worth the visit! Would recommend that you spend atleast half a day there if you are in the area. Wooden architecture: Temple of Fame: "The temple of Fame is a folly in both senses of the word as it appears to be made from stone, but is in fact painted wood." Latrines: Fountains Abbey The "Reredorter"
Built in the 12th century: Fountains Abbey - Founded 1132 "its construction lasted from 12th to 16th century"
133 Community Members have visited.